The US dollar is lower against most major pairs except the Japanese yen and the Swiss franc. The GBP/USD rose 0.19 percent on its way to another positive week, as the European Union allowed a six-month extension to Article 50. 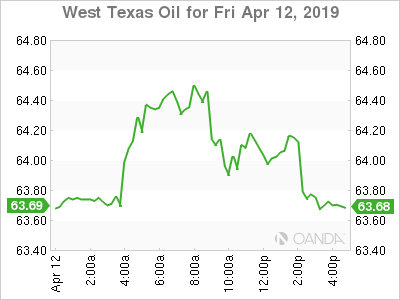 Brent rose 1.03 percent and WTI 0.36 percent on Friday as supply disruptions and stronger Chinese economic data eased concerns about OPEC+ rising production in the summer. 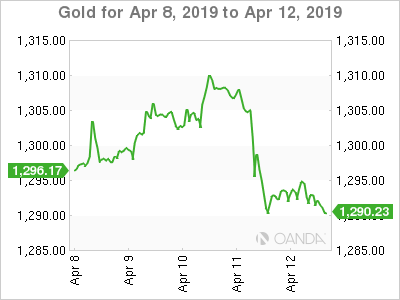 Gold recovered from Thursday's losses, with a 0.11 percent rise on Friday, but is headed for a weekly loss of 0.08 percent. The US dollar is lower against most major pairs except the Japanese yen and the Swiss franc. Risk appetite made a comeback this week and pushed the three currencies lower as investors shied away from safe havens. A strong start to the US earnings season with JPMorgan (NYSE:JPM) and Wells Fargo (NYSE:WFC) leading the way triggered optimism despite global growth warning from the IMF earlier in the week. Central banks were muted this week as dovish rhetoric continues to be the norm. Brexit will be around for longer as an extension until October 31 as the two major parties discuss cooperation that would bring about a softer exit. More time means less pressure on the pound, the currency rose 0.34 this week after the new timeline was announced. 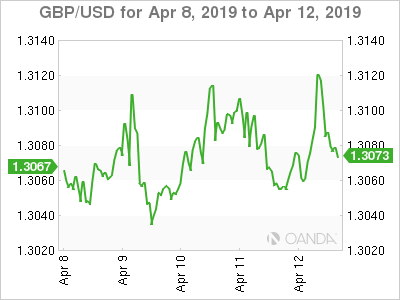 The GBP/USD rose 0.19 percent on its way to another positive week, as the European Union allowed a six-month extension to Article 50. The UK parliament remains in a paradox, not wanting to exit on a no-deal scenario, but not doing enough to support a single soft-exit alternative. The talks between Conservatives and Labour are not likely to break the deadlock, and Halloween could end up being spookier than intended. Wages, inflation data, retail sales and a speech by Bank of England (BoE) Governor Carney in Europe are on the calendar. Brexit pressure will be continued to be applied to the economy as the extension only eased anxiety in the short term, only to be revised come Hallows eve. The pound will be sensitive to political updates as Theresa May's leadership is under threat with a lower valuation if a Eurosceptic captures the Prime Minister's job. 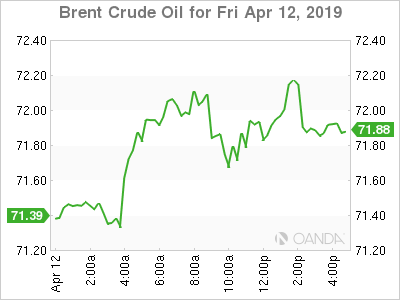 A potential civil war in Libya could wipe out all crude production, and the US sanctions against Iran and Venezuela could end up convincing OPEC+ members to pause their production agreement deal and increase production to offset the losses. The meeting in June will be crucial to the extension of the agreement, but with current prices higher than previously thought, Saudi Arabia will have to make a compelling case to producers. US production has been ramping up and Trump issued an executive order on pipelines to overstep on State level authority. Chevron (NYSE:CVX) announced the purchase of Anadarko (NYSE:APC) for $33 billion in a move that could trigger more M&A activity in the shale industry. Gold recovered from Thursday's losses, with a 0.11 percent rise on Friday, but is headed for a weekly loss of 0.08 percent. The dollar was on the back foot, which helped the yellow metal advance towards the end of the week. US economic indicators have been mixed of late and next week could be another tough test for the dollar with core retail sales and the Philly Fed Manufacturing Index on Thursday. The U.S. Federal Reserve hit the brakes hard in Q1, but as data has improved, rate cut chances are lower, and if retail sales data outperform, it would start building a case for an interest rate lift later this year despite the Fed's dovish turn in January.